Yo ho ho. It’s the final Midweek Mixtape of the year – and what a year it has been in the peak-of-the-week band-clear-out section of ANBAD. Originally conceived as a way to get rid of ANBAD’s new band backlog, it has evolved… well, not too far, really. Still it turned out juts fine in the end: it has been a great way to squeeze another four or five bands into the week whilst retaining an excuse to doctor a picture of a donkey every week. 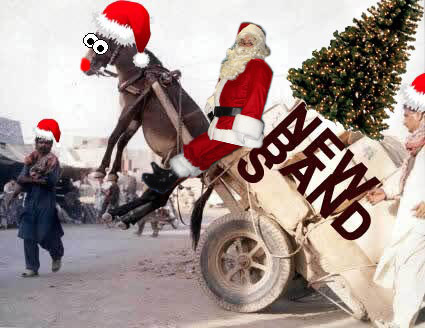 This week, the donkey reaches its Christmas climax. FIRST! Sophie’s Pigeons are another (Mancunian) band whose name asks more questions than it answers. Who is Sophie? Why pigeons? Aren’t they just rats of the sky? If you feed them baking soda-caked bread, do they really explode in the air? All these queries will vanish as you are dazzled by the brilliant Monkey’s Trunkle, which soars higher and with more verve than any other song I’ve heard for months. Swelling, pulsating and excellent. SECOND! The Suzuki Method are not to be confused with The Suzukis. Chances are that once you’ve heard songs like Purple Aki, you won’t, though. High-sheen, low-down, eyes-up pop. THIRD! Tyson – Mike Tyson is on Twitter these days, and it turns out he’s an extremely nice, peace-loving, meditating vegan nowadays. Iron Mike used to walk into the ring to total silence, or sometimes an air-raid siren. It would have been a lot less scary for opponents if he’d walked into the ring to Die On The Dancefloor, an unabashed slab of hi-camp, hi-voiced, hi-hat dance music – a blast from the past with a finger on the pulse of the future. Clever. FOURTH! Did are equally unashamed of their love for throbbing Italiano house, and quite right too. Each song/remix is a huge, star-inducing blow from a golden hammer, sticky with booze and covered in glitter. Embrace them for the party season. FINALLY! Run Toto Run have flitted with ANBAD a couple of times, in review and interview form, and their sound has changed quite markedly during this time. Change is good, and wholly appreciated here at ANBAD. They’re still changing – and so, by way of comparison, read the initial review’s description of their music and then watch the lo-fi, hi-fun video below. Tomorrow, the end-of-year celebrations begin with the Runners-Up in the ANBAD End Of Year Listravaganza. Prepare to teeter on the edge of your seat! Posted on December 15, 2010 by Joe Sparrow. This entry was posted in Headline, Today's New Band. Bookmark the permalink.